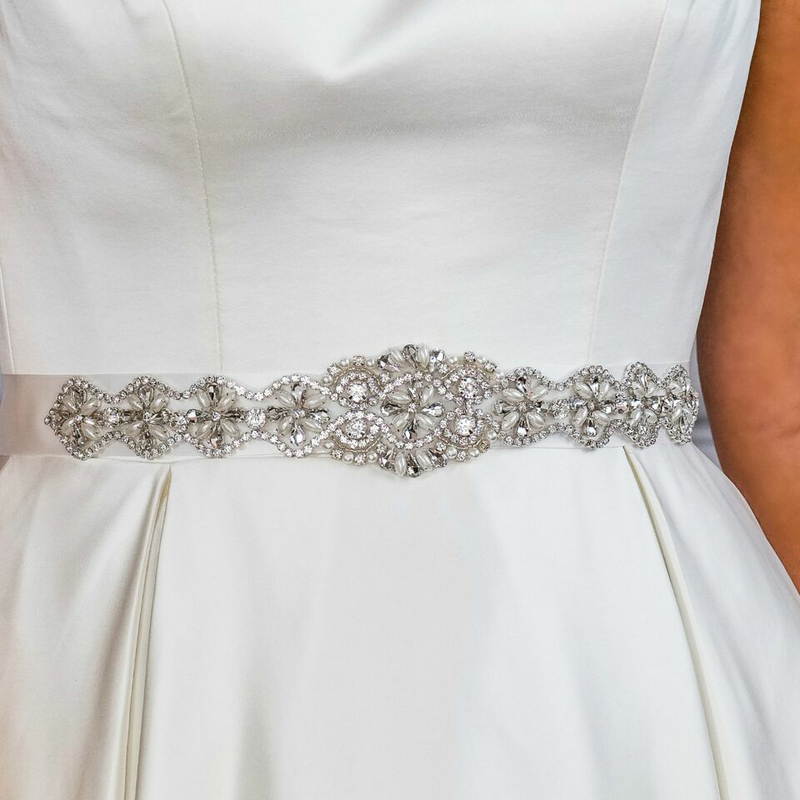 How do I choose the right bridal belt for my gown? 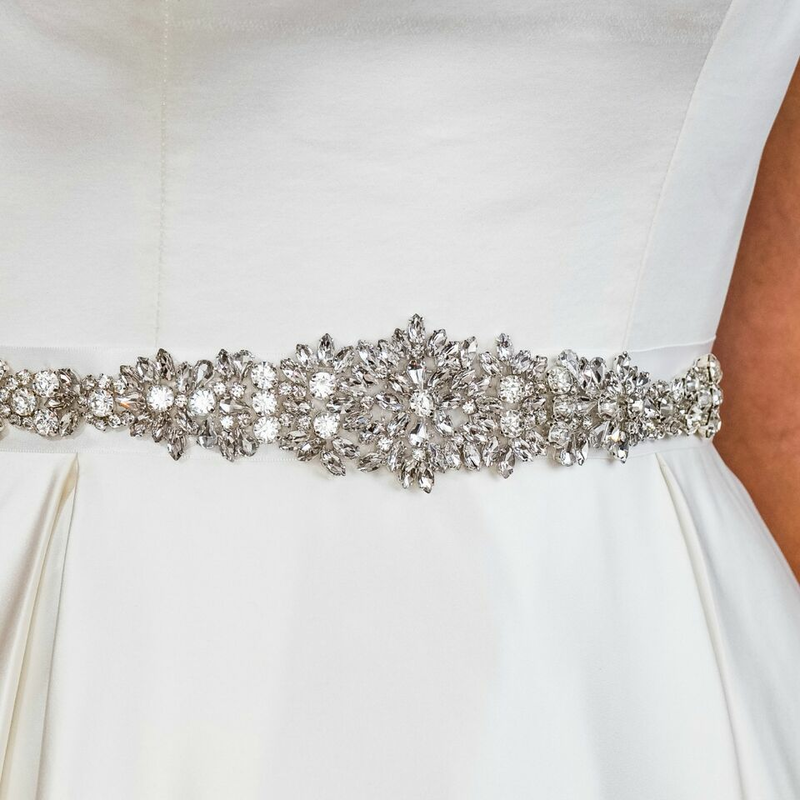 One of the most common questions that we have been asked over the years in the bridal industry is how to find the right belt to accessorise a bride's gown. Nowadays, there is so much choice that it seems impossible to differentiate between belts. Here is a guide to finding the right belt for you! 1. Firstly, you need to decide on what colour satin to go for. Our website has rose gold satin, champagne satin, cream satin, ivory or white. How do you decide between all these options? Well, think of the colours of your dress? You can either match the colour of your belt to you main dress colour, if you would like to keep a running theme. For example, below is a picture of a gorgeous taupe dress with white lace overlay. To keep a vintage theme with the colour and theme of your dress, you may pair it with our Poppy belt which has a vintage feel to it, with its slightly creamier base colour. 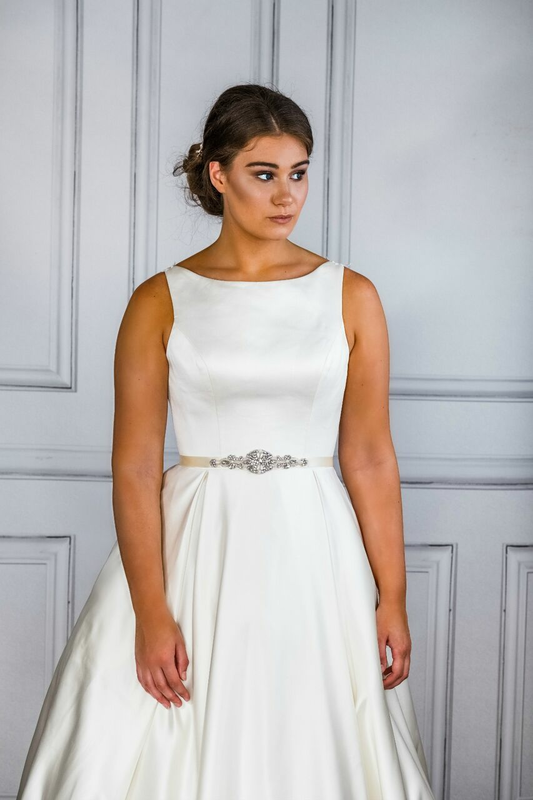 However, if you want to mix modern with the vintage look dress, you may choose a bright ivory satin belt, like our Fleur belt. Think about introducing a completely new colour, such as Rose Gold, which is so fashionable right now. This will add depth to the outfit. Below you can see our Daisy rose gold belt on two different styled dresses. 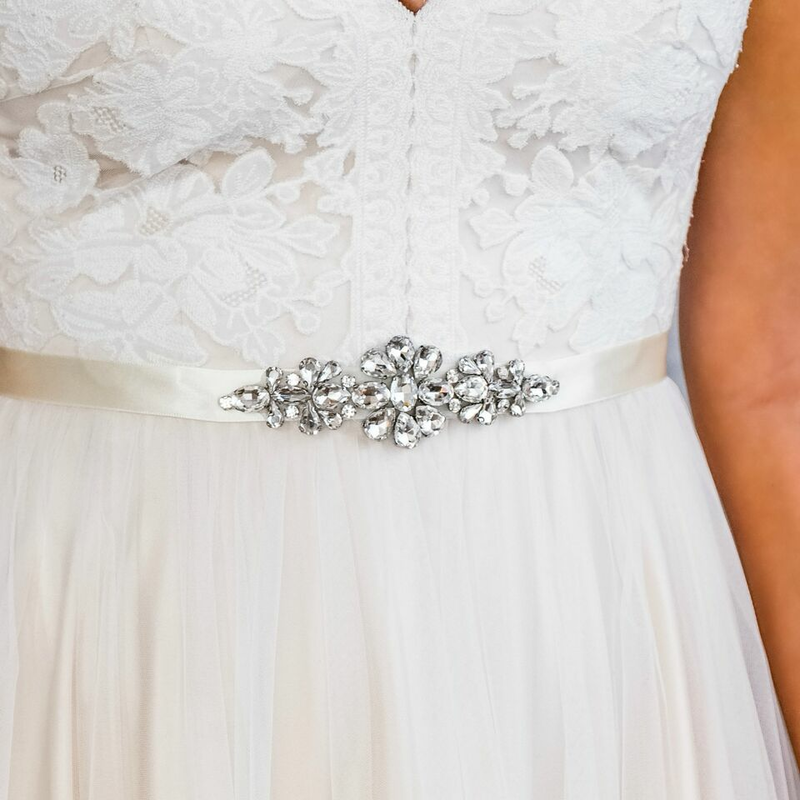 Daisy Belt in rose gold is gorgeous with this lace white dress. You can then match your other accessories such as earrings and hair pieces that we also sell on our website! Daisy Belt in rose gold also looks incredible and makes a statement on this classic satin 50's style dress. 2. 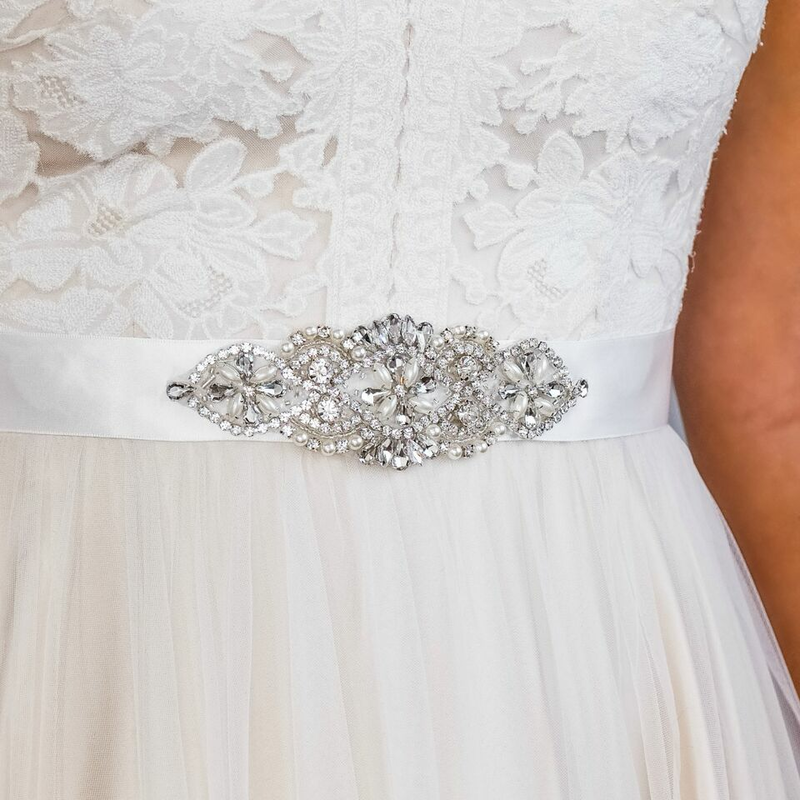 The next question is, what thickness of belt is appropriate for your dress? This is a difficult question as everyone has their own individual preferences. Some like to use the belt as a focal point of the dress, to attract attention to the waistline, in which case we would suggest going for a thicker belt. However, if you simply want to add a bit of sparkle to your dress, then maybe a thinner band is best for you. A thinner band such as The Kelly Belt means less sparkle, but if that is what you're looking for then we have a fantastic selection of thin and thick belts for you! 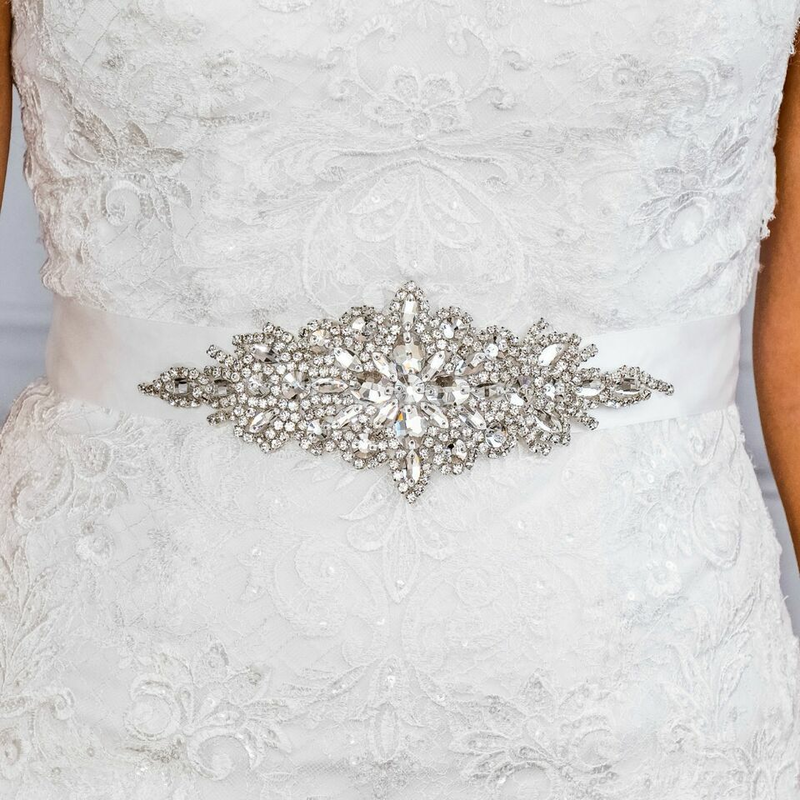 In these photos, you can see the added sparkle given by our Grace belt, dainty and understated. Alternatively, our Helena belt is certainly a statement to behold. It is such a great accessory to accentuate the waist. 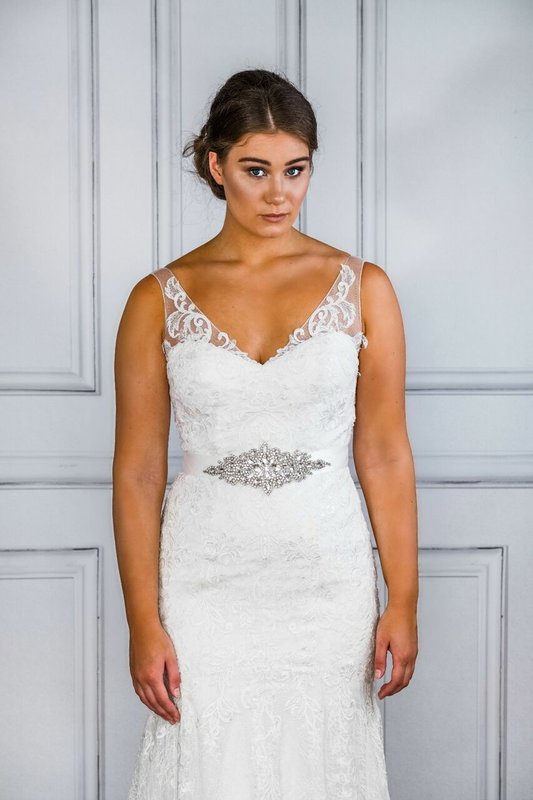 If you wish to use the belt as a way to flatter the figure as opposed to adding a bit of sparkly, Helena is a great option for you. 3. Lastly, you may wish to consider whether you want a pearl belt, a mix of pearls and crystals, or full on diamante sparkle. Take a moment to think about what jewellery you usually wear, because this will be the most comfortable for you. 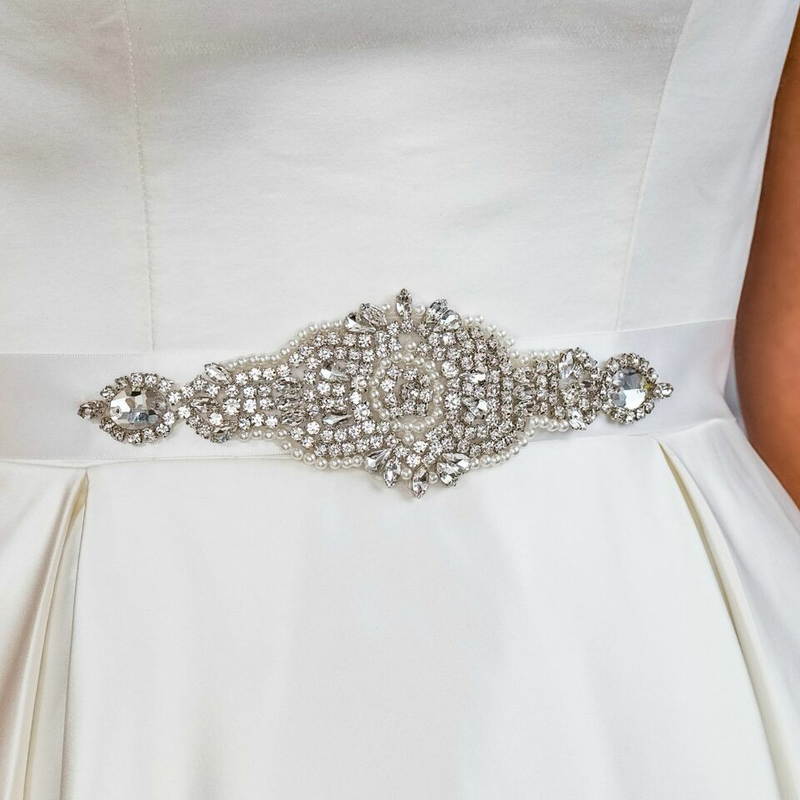 For example, if you wear pearls quite often, try a bridal belt with pearl detailing. This also applies to deciding all of your other bridal accessories that are available on our website. This is our Ruby belt which has a mixture of different sized crystals, no pearls. Chloe has thicker crystals right across the waist, rather than simply in the centre. 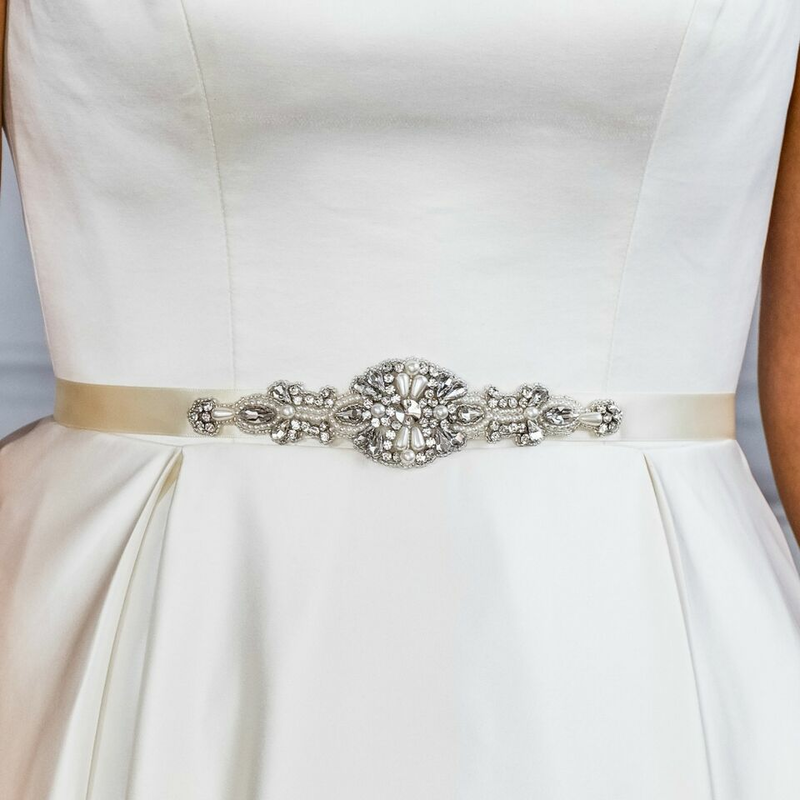 Our Annabel belt has a mixture of smaller pearl beads and diamante. This week's Live Video went through some advice on how to choose the best bridal sash for your wedding gown. Watch the video on You Tube, we hope you find it useful. Thank you for reading another blog post by The Bridal Outlet, hopefully this helped you to choose our belt. Don't forge that if you have any questions we are more than happy to answer them through our social networks such as Instagram, Facebook or e-mail.